The carnival of Santiago de Cuba is the most famous, most traditional and largest carnival in Cuba. It’s an explosion of color, contagious dance and drum rhythms. It’s also a national event due to the fact that in July 1955, Fidel Castro was able to enter Santiago de- Cuba, under the cover of the Carnival, and begin the Cuban Revolution. For the people of Cuba, July 26th is their independence day. It’s a time for them to remember their rich history, culture and community and re-gather themselves. Filled with sensual Hispanic influences and driving African rhythms, Cuban rumba is a primal and raw dance form. In the Cuban culture, spontaneous rumba dances usually breakout on the streets. Instead of waiting for an impromptu Cuban rumba to break out, you can head out to a regular rumba to catch some action and learn the rumba dancing style. The Sábado-de La Rumba at the Centro Cultural El-Gran Palenque, for example, is a popular one. Viñales’ thriving farming community and vibrant vegetation show the traditional side of Cuba. Its famous limestone mountains are locally known as the ‘mogotes’. They are ideal for rock climbing and there’s a large impressive mural that depicts the prehistoric era, along its cliff face, which was commissioned by Fidel Castro in 1931. The best way to tour the hidden caves is by boat via Cuevas-del Indio, where you will travel deep into the tall cliffs with lanterns lighting your way, a totally unforgettable and surreal experience. Every night, at 9:00 pm sharp in the La Cabaña fortress, on the east side of Havana City, the ceremony of “el cañonazo de- las nueve” is held: soldiers who are dressed in 18th century traditional costumes shoot the cannons to warn that it’s time to close the city’s gates. This ceremony has been held in this fortress for many centuries, to help protect the city from enemies. In the La Cabaña fortress you will be able to view and visit a lot of exhibits and museums and the entrance ticket will include a drink! Rising from the Atlantic Ocean along the northern shore of Camaguey provinces and Ciego de Avila, this 280 mile (450 kilometer) long archipelago, is also called the King’s Garden. It contains around 400 of islands. 3 of the major cays in Jardines del Rey are linked to the mainland by causeways, but only Cayo Guillermo and neighboring Cayo Coco have tourist facilities. These twin isles are lined with white sand beaches that melt into warm, clear, turquoise waters and are quite popular with tourists. There are also Flamingos that wander the inshore lagoons and a nature reserve that is inhabited by birds. The Revolution Square is the largest square in Havana. It is dominated by the José Marti Memorial, a national hero who would have been the first president of Cuba if he had made it out of the 2nd War of Independence alive. You can take the lift to the top of the 138 feet (42 meter) monument for a vertigo inducing view of Cuba’s capital. You should also visit the museum at the base of the tower that is dedicated to him. The Festival del Caribe is a week-long festival that is held in Santiago de Cuba. It celebrates dance and music from the Caribbean area. It is also referred to as the Festival del Fuego and the Festival del Caribe. The festival serves as an exchange forum between the diverse cultural manifestations of the Caribbean region and is dedicated to strengthening ties between nations and peoples by highlighting their common cultural elements. It features processions of decorated vehicles, indoor shows, free outdoor concerts and parades of spectacularly attired dancers, beer stands, food stalls and goat pulled cart rides for kids. Between Cienfuegos and Trinidad, hidden away from the tourist trail you’ll find El Nicho, a tranquil place where you can spend one or several of your afternoons – a paradise on earth. Within the Topes- de Collantes Natural Park lie effervescent rock pools, waterfalls and pristine lagoons where you can swim surrounded by incredible bird-life and stunning scenery. People do not come to this wonderful place to enjoy the beautiful sandy beaches– Cayo Naranjo is all about the aquarium that is set in the heart of the Bahía- de Naranjo Nature Park. It is actually in the ocean itself, so the dolphins and other sea animals are free to roam in their natural habitat. You can watch the dolphins doing tricks and see the local sea lions. The Varadero area of Cuba is world renowned for its natural beauty: perfect climate, powder sand beaches and glassy blue waters. These amazing qualities combine together to make this area a grand tourist destination to rival anything that the Bahamas or Barbados may offer. Since it’s in Cuba, it tends to be more pocket friendly than most of the other well-known Caribbean destinations. There are also many inexpensive luxury resorts in Varadero. Tip to tip, the island of Cuba is 745 miles (1200km) long and of the 3 state owned domestic airlines, the Aerocaribbean airline operates most routes. Nearly all internal flights land or take off in Havana and there’re very few resorts and cities which connect directly to any other place than Cuba’s capital, however you can fly directly from Cayo Largo to Varadero. Outside Havana the main-regional-airports are in Santiago de Cuba, Varadero, Santa Clara, Holguín, Camagüey and while Cayo Coco, Cayo-Las Brujas and Cayo Largo, have their own airports that handle flights specifically for Cuba’s tourist industry. Currently, the Cuban train system is the only one of its kind in the Caribbean. In spite of the fact that the Cuban trains are slow and are subject to cancellations and long delays, they provide an amazing way of feeling Cuba’s landscape as you travel around. If you are a tourist, you will require your passport to purchase a ticket at the train station and you cannot purchase a train ticket by phone or online. The main line links Santiago de Cuba with Havana via Camagüey and Santa Clara is generally quite comfortable and reliable. Most of the major cities in Cuba are served by the main line route. The faster of the 2 main line services, from Santiago to Havana, is the Especial, which is also referred to as the”Tren Francés” (the French train). The Especial provides 2 classes of seats and its coaches are air conditioned and leaves Havana once every 3 days. The alternative train service is the Regular. It does not have air conditioning and offers only 1 class of seating, but it leaves more frequently, normally 4 or 5 times per week. Cuba’s buses are also locally known as omnibuses or guaguas and they are the most commonly used means of transport in Cuba, both for interprovincial journeys and within the cities. There are 3 separate bus services that serve the interprovincial routes, Conectando Cuba and for Viazul CUC-paying Cubans and tourists and Astro, a national peso bus service that is reserved exclusively for citizens of Cuba. Víazul is the more comprehensive of the CUC charging bus networks. It offers comfortable seats and air conditioning and is more targeted as a tourist bus service. It connects the main touristic locations and most of the provincial capitals of the mainland. Víazul does not serve some of the most exquisite beach resorts, including Cayo Coco, Cayo Santa-María and the northern-cays in Villa Clara. However, it is still the most reliable, most hassle free and quickest way of travelling in Cuba. The Conectando Cuba bus service, which is also referred to as the Cubanacán-Transtur, differs from the Víazul service in that it picks-up and drops its passengers at the hotels in the towns and cities it serves – they are far less than the number of towns and cities that are covered by Víazul. Although they are by no means exclusively meant for the tourists, the official-metered state taxis that charge in CUC are generally referred to as turistaxis (or tourist taxis), and are generally modern European and Japanese vehicles as opposed to old Russian or American ones. There are a large number of privately-owned cars, including American classics that are operated as taxis in Cuba. Some of the private taxi drivers wait for their passengers at the bus stations, other fixed pickup points and work interprovincial routes. Communal taxis, also referred to as taxis colectivos or almendrones, are more similar to the bus services than the regular taxis. They’re generally privately owned cars, but there are also some state run colectivos, and normally they operate along certain routes, between and within cities and towns. Bicitaxis are 3 wheeled bicycles that have enough room for 2 passengers. They are in use all around Cuba. Cocotaxis are less common and are strictly aimed at Cuba’s tourist market and provide the novel experience of riding around the city or town semi encased in a large bowling ball and dragged along by a scooter. Given that some of the destinations in Cuba are not served by the train and bus networks and the infrequency of the buses on most routes, it makes a lot of sense to rent a vehicle if you are planning to travel a lot. Although hiring a vehicle in Cuba is relatively expensive, traffic jams are nearly unheard and away from Cuba’s major towns and cities, most roads – including motorways – are nearly empty, this means that you will be able to get around quickly. Cycling tours are quite popular in Cuba. 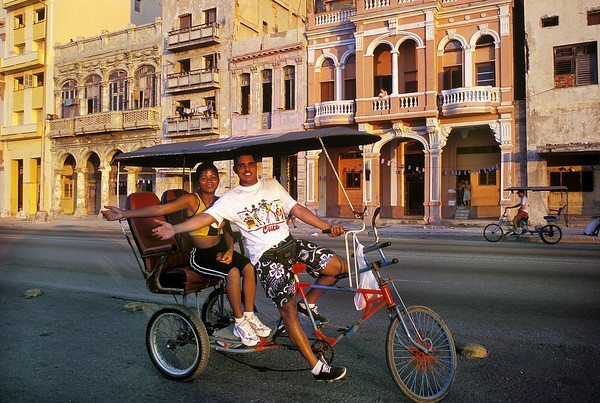 Nevertheless, although basic Chinese manufactured bikes are quite common in all cities and towns, cycling for sport or recreation isn’t quite popular among citizens of Cuba. There`re no proper bike rental agencies or cycling shops, and surprisingly quite a few places selling spare parts or renting bikes, but some of the hotels do rent out their bicycles. The most straightforward long-distance cycling opportunities for tourists are pre-packaged cycling tours.